Eugene von Guérard, born in 1811, began his life in courtly Vienna1 where his father Bernhard, a painter of miniatures, enjoyed the patronage of the Royal family. With changes in taste over time, however, von Guérard senior was obliged to seek patronage elsewhere, and so in 1830 father and son left Vienna, moving to Venice, Milan and Turin before arriving in Rome where the family resided two years. Eugene was enrolled in an art school operated by the Italian classical landscape painter, Giovanni Battista Bassi, where he could add to what he learned from his father by receiving tuition in the tradition of Salvator Rosa, Nicholas Poussin and Claude Lorraine. In Rome he also came into contact with members of the Nazarenes, a group of young contemporary German artists working in a style that referred back to the Renaissance. In 1832 father and son moved again, this time to Naples, where Bernhard had been appointed court miniaturist. In the ensuing years the pair lived and worked all over southern Italy. Upon his father’s death in 1836, Eugene decided to return to his father’s birthplace in order to further his education at the Düsseldorf Academy, while continuing to paint local landscape subjects around Germany. In 1852, von Guérard made the decision to join the Australian Gold rush. By then he would have gained considerable experience as a painter, not only in the exacting style practiced by his father, but also in contemporary theory as practiced by the German expatriates in Rome, as well as first-hand experience of some of the worlds’ great collections of classical art and the Italian landscapes that had been the staple subject of generations of Italian and visiting artists from all over the world. Nevertheless for his first year and a half after his arrival at Geelong on the 24th December, aside from making a sketchbook recording of his life at Ballarat, he devoted himself, albeit without a great deal of success, to mining for gold before eventually resuming his painting career in Melbourne in 1854. Notwithstanding some fine notices and commissions, von Guérard initially struggled to gain ground as a painter in the colony and in 1855 resorted to selling his work by lottery, a common enough expedience for artists at the time. The Argus, 1 February, 1855 reported ‘… a first rate painter like M. Guerard has been driven from the shores of Victoria from inability to procure bread by the exercise of his genius'2 In fact von Guérard did find buyers and was able to send works to clients living in Italy, Germany, England and America. In his later years, after his return to Europe to live in London he continued to paint Australian subjects for export. At this stage of his life, while he worked and waited to establish himself in Australia, he was able to find buyers, either in Australia or outside, for paintings based on European subjects. Strada di Messina a Catania is a fine example of such a work. Something of the cosmopolitan flavour of the artist’s position and work of the period is underlined by the multilingual inscription at the foot of the work: Eugene de Guérard (the French version of his name) Melbourne (in English) 1856 Strada di Messina a Catania (Italian). The scene may have been painted from memory and was probably based on a sketch drawn some 20 years earlier, during the period he was in the area with his father working for the King of Naples. 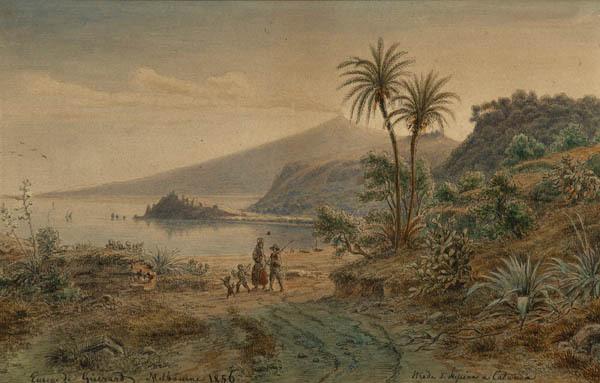 The painting depicts the Sicilian coastline viewed south from Messina towards Catania, with travellers on the road and the still active volcano Mount Etna in the distance.